Hey everyone, please check out the post compo version HERE! I think this is the basis for a really nice game. However the zoom was a little fiddly which wouldnt have been a problem if it did not default the distance back with each new turn. I found myself wanting the camera about 2-3 times further away, for a tactics game anyway. Moving each player twice is a little repetitive, there is already enough team members to manage. I would suggest a move range outline in purple and then blue for example to show a 1AP or 2AP move in a single click. Anyway these gripes are probably beyond the scope of the jam. Well done on even getting a turn based tactics game running! Well done! Wished I had someone else to play. Self beating is silly. I was able to navigate on of the corporation people to the the chip position but they never picked up the chip? Also, it would be easier if I were able to select the guy I want to move or do some other action and the 'End Turn' will signify the end of my entire turn and not just the end of turn for one member in the corporation/punks. It appears to me that the chip was somewhat closer to the corporations than the punks. Is that the case? I had way too much fun playing against myself. Local two player without split screen? The future is indeed now! Great music, interesting gameplay similar to X-Com and other turn based combat games. 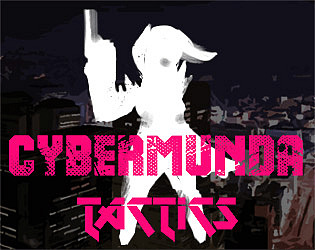 An excellent addition to the Cyberpunk game jam!